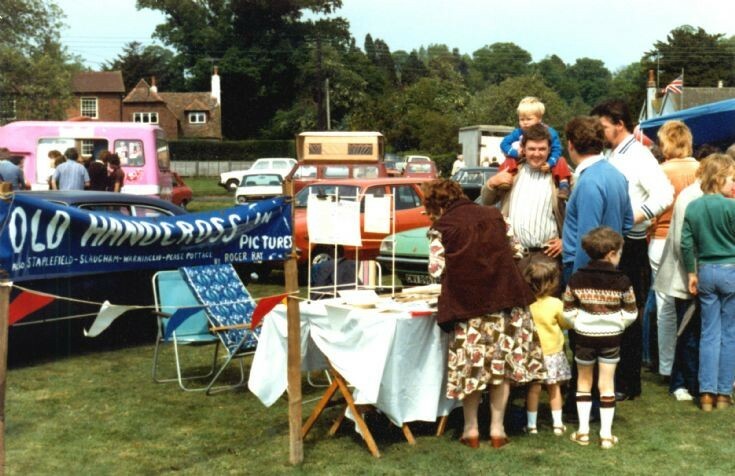 This is a general view of a fete held on The Common at Staplefield. No details came with the photograph but an expedition to the village by Mick and Daphne Lane, and some research by Steve Cook came up with the identification of the houses in the background. On the extreme left is the former post office and village stores now named Old Post, and next, with the two white chimneys, is Post Office Cottage in Tanyard Lane. On the right is Pear Tree Cottage on the other side of Tanyard Lane. A chance encounter has brought together Steve Cook with his son, Russell, on his shoulders, and Bill Boxall in the blue jumper with his children, Paul (5) and Sharon (3). Standing between them in the white jumper is Andrew Cook. The absent stallholder is my father, Roger Ray, who was showing some of his personal archives, many of which now appear on this website. I suspect that this photograph was taken by him, which explains his absence! Select Open Document to read one of the many articles of Staplefield written for the Mid Sussex Times by Sue Tupwell. The one appeared in the edition of 22nd November 1991 just a couple of weeks after my father had released his third and final book on the local history of the four villages in the Slaugham Parish, plus Staplefield.